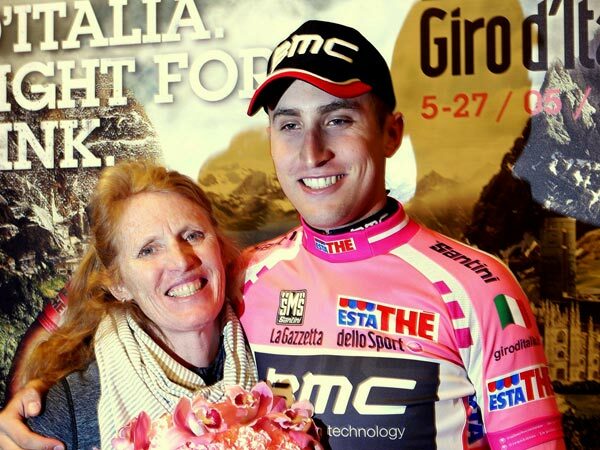 Taylor Phinney lived a dream and rode into the Giro d’Italia’s pink jersey today. The American of BMC Racing ripped around the 8.7-kilometre course in Herning to post a time of 10-26 minutes. Geraint Thomas (Sky) held the best time at 10-35 minutes, but saw Phinney come over the line nine seconds faster. In the previous days, he rode the course more than any other cyclist it seemed. After the press conference on Thursday, he went back out on his bike at 7:30 in the evening to prepare. He now lives with several other Americans in Tuscany. He recently moved from Lucca to Quarrata, where Great Britain’s academy used to be based. His focus, though, was on the opening stage of his second Grand Tour, 1800 kilometres away in Denmark. “I’ve been nervous for a couple of weeks, but as the race got closer, I started to get less nervous. I slept in until 9:30 this morning and hung out all morning,” he continued at the finish line. Phinney rode with a spoked front wheel instead of the carbon tri-spoke Thomas used. Both went off under clear skies, but fought the wind and cold. Tomorrow will be cold again and wind should sweep off the coast from the west and north. Local, Bjarne Riis said it won’t be hard, but it’s bound to blow riders across the road. Giro d’Italia 2012: Who will win?